This is our fine gold recovery system. 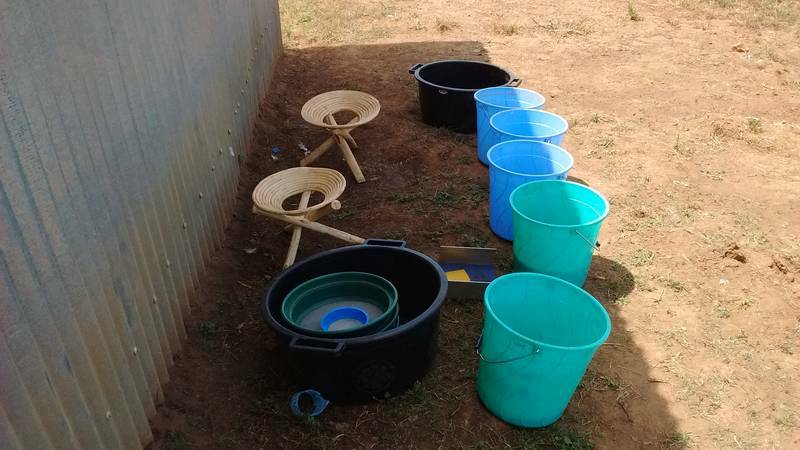 A set of buckets and basins, classifiers, sluices, gold pans. Very simple. We can recover finest gold particles without using mercury. Process is fast and simple and we use the principle and the rule that key to recovery of gold is concentration. So we do that. We concentrate it. First we are concentrating the gold on the fine gold sluice. Then we obtain the concentrates we concentrate the concentrates on a smaller sluice and get very much of the gold in very little of black sand concentrates. Those are panned out and subsequently fine gold revealed and recovered.